The current dearth of trans-Atlantic award availability has not always been the case with American AAdvantage. Some of my very first rewards credit cards helped me accrue a large quantity of AAdvantage miles. I used these In 2016 for outbound and return flights in business class on Iberia and American, respectively. The Iberia flight was one of the better business class experiences I have had and I continued to accumulate American miles, not only through new Citibank and Barclay business credit cards but also by making heavy use of the American AAdvantage eShopping portal. However, over time, finding award availability on American has become downright impossible. I was unable to find flights on American metal for our trip last summer and my luck was no better last week. Despite traveling outside the incredibly high-demand European peak travel season, I did not find a single American business class award seat to any European gateway. I did find one from Miami to Milan but I was had not firmed our plans at that point so I was unable to book it before it disappeared. And I found that flight through Alaska Airlines Mileage Plan rather than directly through American! Even using the AAdvantage eShopping portal has gotten more difficult. I have had two instances in 2018 where miles did not post properly to my AAdvantage account. I had to spend a lot of time following up on these (with one still outstanding) to earn miles that only serve to tease with me unattainable travel to faraway destinations. 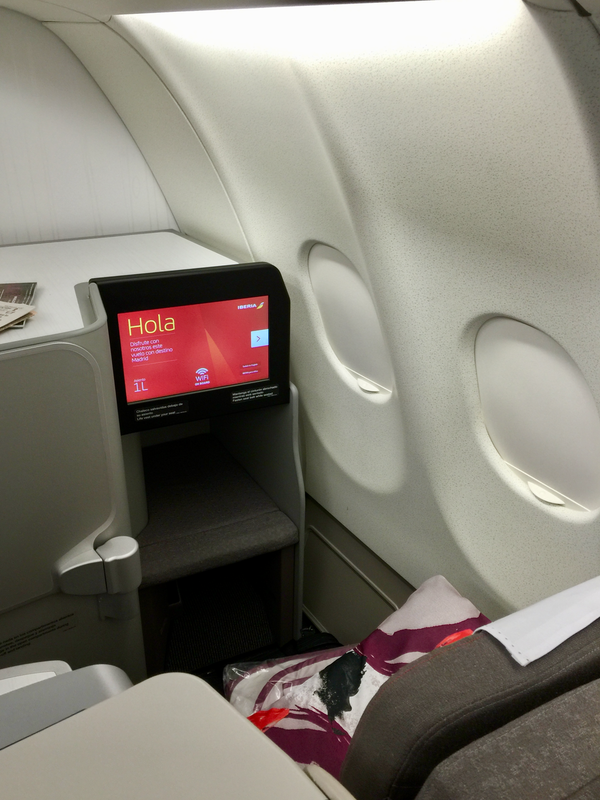 I flew from New York-JFK to Madrid in Iberia business class using AAdvantage miles (click to enlarge). My primary reason for collecting frequent flyer miles is for flying in international premium cabins. If I can’t achieve that goal with a certain points currency, what good is that program to me? Between credit card signups and online portals, I have accumulated enough miles for several international business class saver awards. In theory. I could use the miles for to travel on partners of American Airlines but even those seats were harder to find this year than it was a few years ago. When I booked our Iberia flights from New York-JFK to Madrid in 2016, I had several flights over several days from which to choose. This time, there was no Iberia space available via AA. There was plenty of availability on British Airways using AAdvantage miles but flying through London, though requiring fewer miles than I wound up using on Delta, would have incurred fees of more than $1,100 for two tickets! For that much, why am I bothering with points since I once booked a business class sale fare on the former British Airways subsidiary, OpenSkies, for around $1,200! Given these challenges, I will no longer go out of my way to accumulate AAdvantage miles. This means no new AA-branded credit cards for my wife or me. I need to reexamine my credit card portfolio for 2019, with a specific eye on the three American Airlines co-branded card I hold. The Barclays AAdvantage Aviator card does rebate 10% of redeemed miles. If I am able to find domestic space, I will keep that card long enough to get the rebate. But that is about the only reason I see to keep any of these cards. When I shop online, I will only use the AA portal if there is no other reasonably good alternative. Finally, rather than hold onto my miles absent a strong indication that international business class award availability will improve, I may use my current balance for a U.S. vacation for my wife, the kids and me. Domestic inventory seems to be better, and if I could find five award seats, those miles could save a significant chunk of money. That’s not an optimal use of miles, but is superior to “unable to use them.” However, domestic travel is not why I invest time and effort in acquiring miles. For relatively short domestic flights, I am perfectly fine flying in economy, which offer paid fares that are generally far more affordable. Which brings me back to why, unless things change with American Airlines international award availability, I won’t actively accumulate American AAdvantage miles any longer.